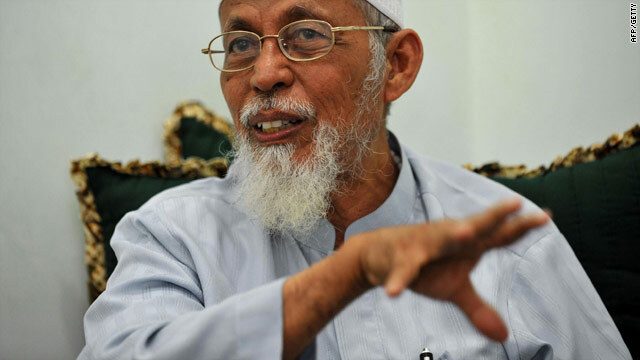 Islamic cleric Abu Bakar Bashir, seen here in 2008, was arrested on Monday by Indonesian police for setting up militant camps. Jakarta, Indonesia (CNN) -- An Indonesian official said suspected members of a terror cell arrested in the past week were "chatting" about targeting foreign embassies, but it is not clear whether they planned to follow through. Ansyaad Mbai, head of a government anti-terror desk, said he could not confirm that the group was targeting the U.S., U.K. and Australian embassies. "They were just chatting about it, but it's not confirmed," Mbai said. He said the five suspected terrorists were talking about targeting the embassies during police interrogations. Mbai confirmed one of the main targets was the national police headquarters "because they conducted surveillance and took photos of the building," he said. On Monday, Islamic cleric Abu Bakar Bashir was arrested for playing a key role in the establishment of a militant training camp in Indonesia's Aceh region, authorities said. Bashir -- a religious leader known for his anti-Western rhetoric -- has been arrested twice previously for his activities in connection with militant groups. He was detained in West Java and later brought to the national police headquarters for further questioning. Authorities have strong evidence that Bashir played a role in establishing a terror cell and a militant training camp in Aceh province, said Edward Aritonang, national police spokesman. Police raided that camp in February and arrested dozens of militants who were allegedly planning terror attacks in Indonesia similar to those that took place in Mumbai, India, in 2008. In May, several members of a hardline organization Bashir founded -- the Jama'ah Ansharut Tauhid, or JAT -- were also arrested and charged with raising funds for the training camp. Following months of speculation on Bashir's involvement, police said it's clear he played a key role in setting up the terror cell that wanted to base itself in Aceh. Bashir was first arrested after the Bali bombings that killed more than 200 people in 2002. He was charged with terrorism and immigration violations, and served 18 months in jail. He served two-and-a-half years in jail, and was released in June 2006. "I'm sure the police have a very strong case. They would not arrest him for the third time otherwise," said terrorism expert Sidney Jones of the International Crisis Group, a nonprofit that works to resolve deadly conflict.